This is out 14th year here at Watercolors. From our very first time till this year our family just loves coming here. We have stayed in many homes and most of them are really nice and then some of them are exceptional like the snow be happy s year at 196 Red Fern Way. The new pool at the Camp is awesome and can’t wait to see the new beach club and pool when it opens next year. 360 Blue are great to work with and so very helpful for all of our needs. All in all renting from 360 and coming here is a very rewarding experience. We can't begin to say how amazing this home is. We had the most wonderful week in this gorgeous home. The floorplan is perfect for families and the decor and furnishings look like they came straight from the pages of a high-end magazine. It's just gorgeous and looks and smells brand new! The kitchen is amazing with everything you need to cook gourmet meals. The bikes and golf cart were great to have and the pool was nice to see (although we did not use this week). This home sits on a lot with a greenbelt on one side, another across the back and an empty lot on the other side making it feel super private but still close to the action of WaterColor. The Camp Pool is directly across the street but far enough away to not hear any of the activity. The upstairs balcony was great for family game night and the fire table in the center was perfect. All of the beds are extremely comfortable as well. 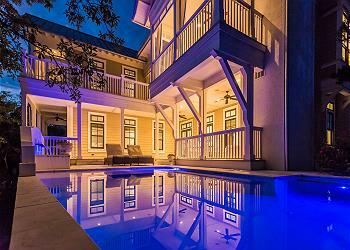 We highly recommend this home to anyone looking for a feeling of luxury yet comfort on beautiful 30A. 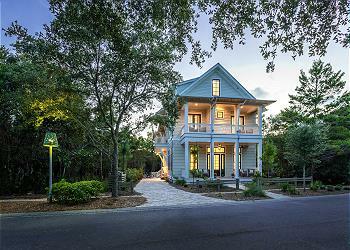 We could not be more thrilled to hear how much you enjoyed your vacation with us at this amazing home in Watercolor! We agree that this home is perfect for everyone and gives you plenty of privacy without isolating you from the amenities of the community! Thank you for staying with 360 Blue, we hope to host you all again soon!